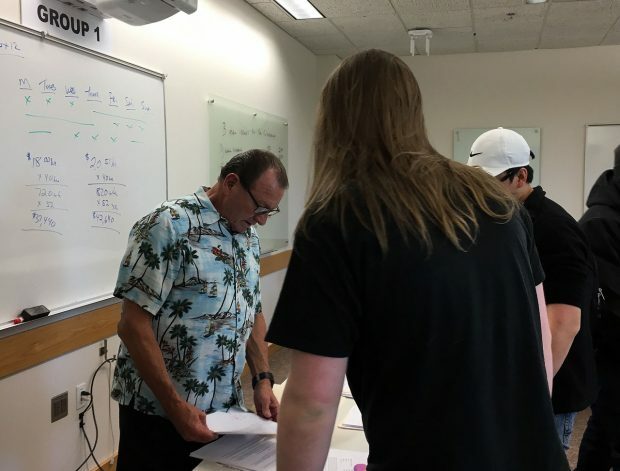 Spring semester enrollment at Salt Lake Community College opened earlier this month, leaving current and future students rushing to pick the classes that fit their busy schedules. SLCC offers so many interesting classes, but sometimes the course description found online doesn’t do a class justice. One of these interesting classes that deserves to be highlighted is Introduction To Criminal Justice, also known as CJ 1010. Noah Brock, a general studies major, takes Professor Frederick Baird’s CJ 1010 class twice a week. He says that not only does the class knock out two general study requirements at once, it’s eye-opening to be a part of. “This subject is vital to building opinions on politics, including drugs, law enforcement, politicians and much more,” Brock says. A typical class starts with looking at the news, where Baird leads a discussion on attacks, issues and current events with the class. “It seems we have multiple discussions a day that are engaging and enjoyable to be a part of,” Brock says. Before he started teaching at SLCC, Baird was a police officer and taught Peace Officer Standards and Training (POST) classes for new police recruits, as well as in-service classes for veteran officers. CJ 1010 consists of learning about the various departments in law enforcement, laws, punishments, salaries, and issues that come with being a police officer, among other things. Baird also touches on the current climate around law enforcement, from hiring issues to retaining officers and regaining the public’s trust and respect. He hopes that with this class, students will gain knowledge of what really happens in the criminal justice world on a daily basis and how officers try to ensure the safety and well-being of all citizens. “We often rely on social media to tell us about the things going on around us, but it’s often biased and altered from its reality. This class goes through real-life situations that police officers go through and the truth behind it,” says criminal justice major Dianna Cervantes. CJ 1010 would also benefit students who are unsure of their major. “I think it’s a class that is open to people of all majors. Its purpose is not to force people into joining the law enforcement career, but rather educate them on the reality behind it,” Cervantes says. For both the professor and students, the class discussions seem to be their favorite part of the class. 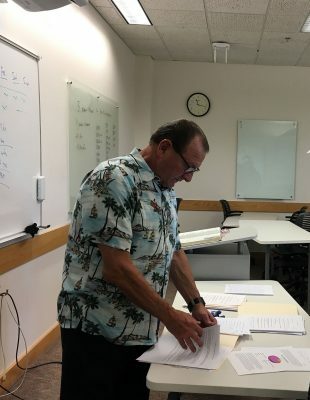 “My favorite part about teaching this class is generating class discussions, and having the students ask questions and present their thoughts and questions, which oftentimes leads to additional discussions and new topics,” Baird says. Students feel they can speak candidly about different issues surrounding law enforcement. “I get to voice my opinion and participate in class discussions,” Brock says. “My favorite part of this class would be how involved he lets us be in our class discussions. It’s refreshing to look into real cases and current news,” Cervantes says. Introduction To Criminal Justice is the first criminal justice course a student can take with no prerequisites needed. The required book for the course is low cost and the curriculum is easy to follow.